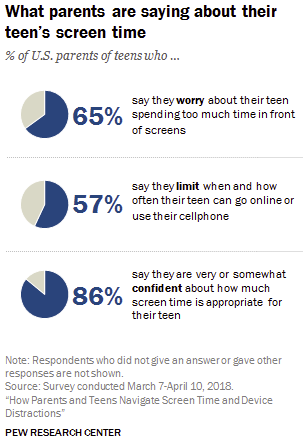 It’ll come as no surprise that teens are using their mobile devices and social media a lot, but what is interesting, stemming from the latest Pew Research report into teen device usage, is that teens themselves think that they spend too much time on their smart phones and connected devices. 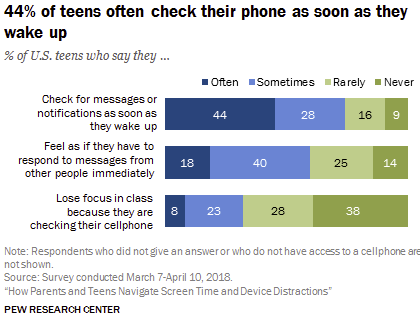 As you can see, the teens themselves appear to be concerned about the amount of time they spend on their devices, though the follow-up inquiries suggest that teens don’t necessarily see this as a potential negative, at least not as much as parents do. 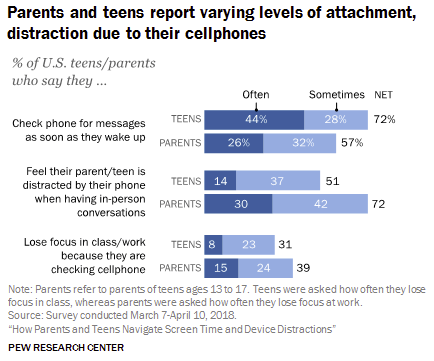 Parents are more convinced that teens are distracted – though it’s interesting, too, to note the disconnect in understanding. The numbers suggest that parents hold concerns about the impacts, yet they underrate how much their teens are checking their phones in the morning. That could mean that they don’t even know exactly how active their teens are, potentially influencing their viewpoint. Further results show similar mismatches in the data – here, it shows that teens, in the majority, don’t feel that they spend too much time on social media or playing video games, yet they do feel that they should cut back on both. That could mean that they personally feel comfortable, but societal pressure makes them feel more obligated to cut back. But the clear evidence here points to the key role smartphones and social media play in the modern interactive process for your users. Most check for messages as soon as they wake up, and feel obligated to reply quickly. In a broader societal sense, it’s hard to say what these findings mean. There are no definitive reports which suggest that increased screen time is universally bad for a teen’s health, though there are clear links between social anxiety and depression associated with posting on social platforms and being judged by peers. Part of the confusion, however, lies in the way that social networks keep us connected – now, teens aren’t simply ‘rotting their brains’ playing mindless video games in their own little bubble, they’re interacting via their devices (even within games) and building social bonds that would have been impossible in years past. 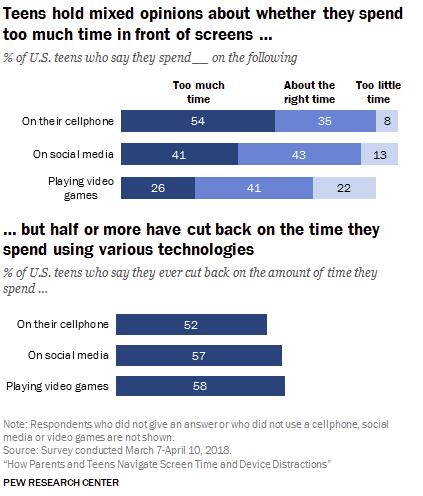 Given this, some of the perceptions around screen time and mobile use are largely out-dated – as shown here, parents still clearly hold concerns about excess screen time for their kids. Is that valid? Should they be concerned? There’s no blanket answer – for some, the exposure to social audiences can, as noted, have psychological and developmental impacts, while for others it can be a benefit. But much like the long-standing myth that sitting too close to the TV is bad for your eyes, it will be hard to shake perceptions, right or wrong, about excessive screen time, and come to an understanding of what’s appropriate and beneficial, for our kids. Awareness is key, though it is difficult. It’s important to have some understanding of what your children are exposed to, and how social platforms are being used, but it’s hard to know whether policing usage time will have a positive or negative impact. But then again, as we’ve seen with the way social media has been used to influence voters, this is largely the same debate we’re having across the board, for all users from kids to adults. Is the capacity of social media to connect society more beneficial than its capability to facilitate tribalism and division, along with the potential psychological impacts? We don’t have any real answers on this as yet. You can read the full teens and parents report, which includes a heap more insights and stats, here.